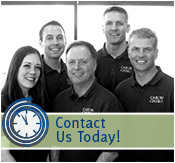 Caron Chiropractic Clinic, PA, serves the people of Minneapolis, St. Paul, Highland Park, and many other nearby towns and cities in Minnesota. The Caron Chiropractic Clinic offers a full range of chiropractic services, and does so professionally, caringly, and courteously. Our staff will work with you to help your body get back to a state of wellness so that you feel better. Your treatment plan will be individualized so that it works optimally for you, and it will be based in the medical science that forms the foundation of chiropractic care. Back pain is the most common complaint that is heard by chiropractors. At Caron Chiropractic Clinic, P.A. we are well versed in Corrective Treatment Options that are non-invasive and offer beneficial health results. We have a Holistic healthcare approach to pain management. This means that our corrective therapies are all natural and do not rely on drugs or surgery to achieve results for our North Oaks and St. Paul, MN patients.